Designed for active use, The FlipBelt is a sleek, form-fitting way to carry your workout essentials with no bulk and no bounce. Every time I walk, bike and x-country ski with this friend, she's wearing it. I'd say that makes it a hit! My husband uses his almost every day!! This was a gift for a fiend I walk with who carries her phone. She loves being hands free now! The belt is comfortable and easy to wear. It holds phone, identification and money. Great for workout and shopping when you want hands free. When runner and founder of Level Terrain Apparel, Mia Do, couldn’t find a comfortable, form-fitting solution for her phone and other personal items, she invented one. Every bit as flattering and contoured as the rest of today’s athletic wear, FlipBelt is designed to carry your on-the-go essentials without tying up your hands. Made of a moisture-wicking, antibacterial spandex-lycra blend, FlipBelt slides right on and sits snug on your hip. No bulk. No bounce. FlipBelt is machine washable and fast drying. To keep items secure, all you have to do is flip the belt inward. 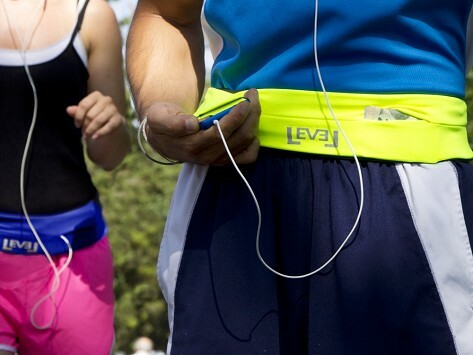 Now, everything you need while exercising fits right around your waist. Have a great workout.